Hip replacement surgery is indicated in select patients with diseased or injured structures of the hip. Most often, hip replacement is indicated in patients with osteoarthritis of the hip. Surgery involves removal of arthritis or damaged cartilage and replacement of the hip structures with metal, ceramic, and hard plastic (polyethylene) implants. If you are a candidate for robotic hip surgery, your surgeon will order a detailed CT scan of your hip joint prior to surgery. This CT scan is integrated into the robotic software and a virtual 3D model of your unique hip structure is created. This model helps your surgeon decide on an individualized surgical plan by calculating the exact size of the implants to be used and the precise position that these implants should be inserted. This provides you the most optimal outcome. On the day of surgery, you will meet several members of the surgical team including nurses, assistive staff, and anesthesiologists. You will be positioned in the operating room and your hip prepared prior to surgery. The procedure is performed through a small incision on the thigh. Throughout the surgery your surgeon controls the movement of the robotic arm, which assists with accuracy in placement of the implant. 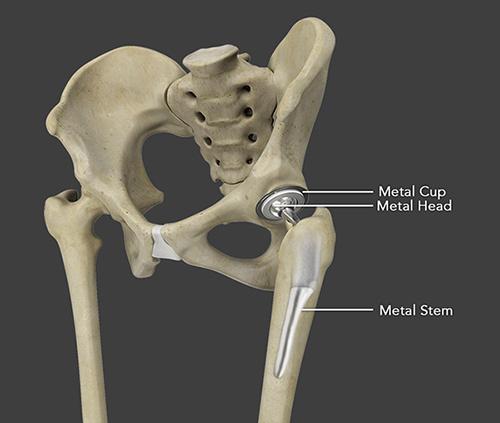 The first stage of robotic-guided total hip replacement is hip registration. During this process, a sensor is placed on the pelvis to track the position of the hip. This is matched with the virtual 3D pelvic model created earlier from your CT scan. Following registration your surgeon will be guided visually and will be provided measurements of your unique anatomy on a real-time basis. Throughout the surgery, the robotic system also provides dynamic information to enhance accuracy of the procedure, and auditory, visual and tactile feedback so that your surgeon follows the surgical plan precisely. Using the robotic system, your surgeon prepares and shapes the acetabulum (cup) to receive the metal cup implant. The robotic arm assists in placing the implant in the perfect orientation and depth. After the acetabulum is prepared, the femoral head (ball) and neck are prepared and the femoral implant is accurately inserted into the femur. The two components are then brought together and your surgeon confirms accuracy of the size and alignment of the prosthesis.